If it's Hawaii tourism data you're looking for, then you're in the right place. We'll cover the latest tourism trends on the Hawaiian islands and provide a series of graphics and summarized data to give you a good idea of what's happening by the numbers. The adjacent graph shows the Total ARRIVAL Data in 2018 to each island (including multi-destination/island arrivals). You can also view our historical 2016 data graph and 2006 data graph for comparison. 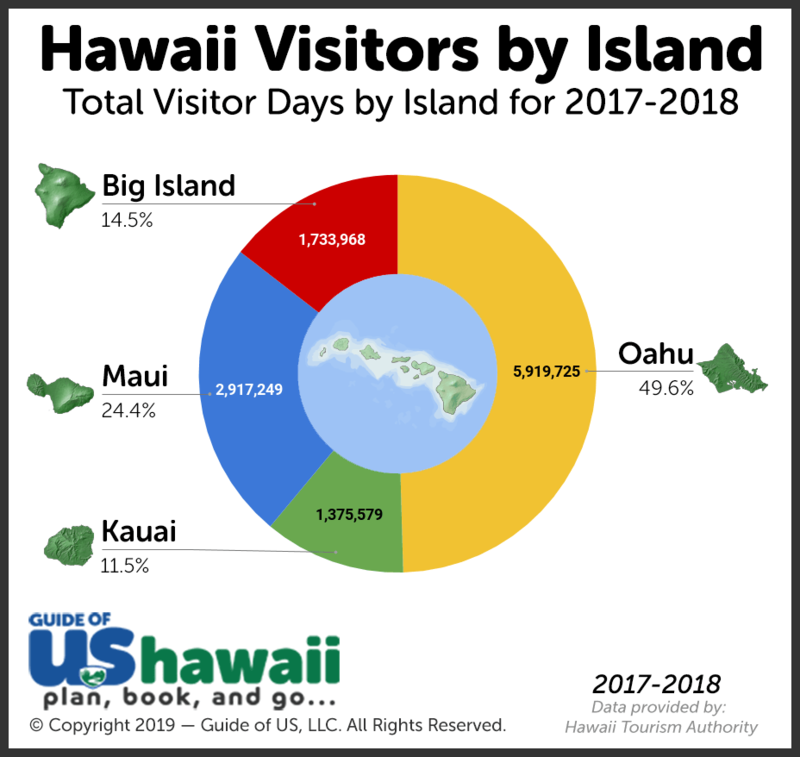 A pie chart is not truly the best format to display the visitor totals for the various islands as the number of visitors shown in the chart is greater than the true total, as many visitors go to more than one island. However, for our purposes, it should give you an idea of how many visitors (percentage wise) are arriving/visiting each island. Just keep in mind the actual arrival numbers are "inflated" a bit. 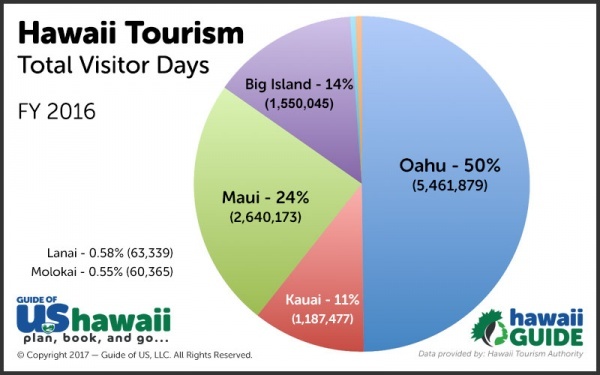 A more accurate way to look at this is 'Visitor Days,' per island, but these percentages seen here provide an accurate overview of each island's visitation. 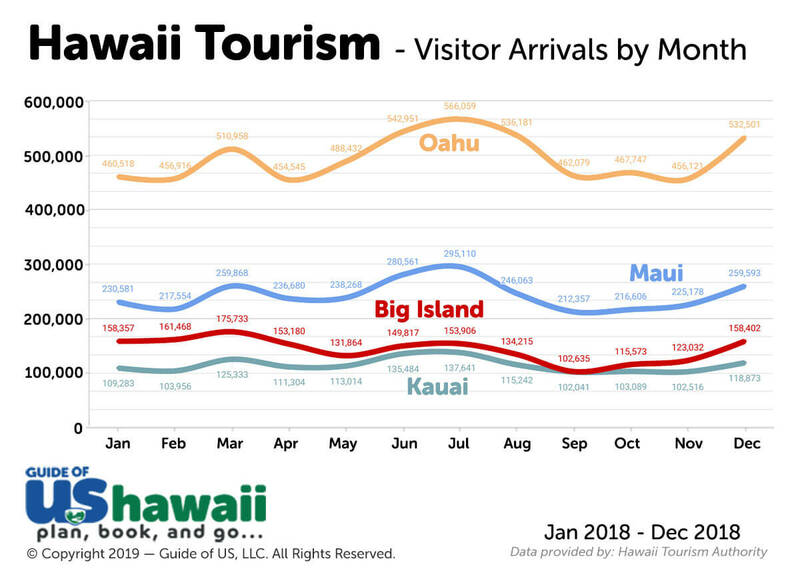 The tabular chart shown further below gives the breakdown of visitors in the islands on a month by month basis (color coded per island), based on data from 2017-2018 visitor reports. In considering the "health" of the tourism market, one must also put emphasis on the two factors that are the most important: "visitor days" and "visitor expenditures." Mahalo for the tip by 'amberloo' at TripAdvisor. In her words, "If there are more visitor days and more money being spent annually over the long-term, the industry is healthy regardless of any other factors; such as mere arrival totals. The goal of many government planners is to increase "days" and "spending" while limiting (or even decreasing) arrival counts." Why limit arrival counts you might ask? One has to consider tourism "capacities" of the islands and how that will affect future trends. Maui and O'ahu likely reached their carrying capacity (for visitors) years ago, thus have few remaining competitive development opportunities and will not have the statistical fluctuations or upside growth potentials seen on Kaua'i. In fact, due to growth in recent years, Kaua'i has now about reached its own carrying capacity pending completion of on-going development. 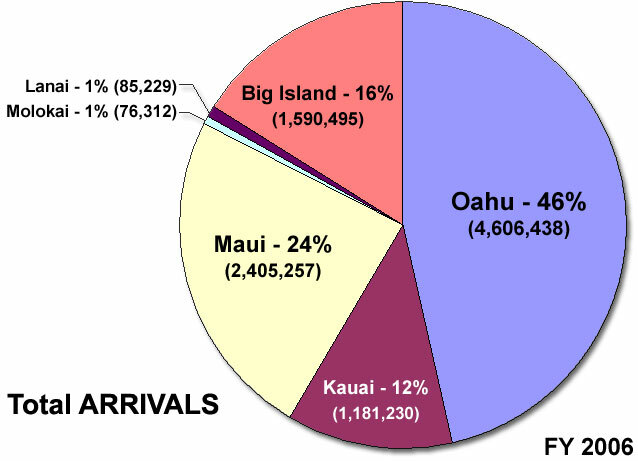 These statistics are "arrival" data - meaning visitors who arrived in the islands (either from the mainland US, abroad, or from another island). When viewing these statistics, we encourage visitors to keep the geographic size of the islands in mind. For example, the Big Island and Kauai have very similar trends in arrivals. However, the Big Island is significantly larger geographically speaking than Kauai (in fact, it is larger than all of the other islands combined) so these visitor numbers alone cannot tell the complete story. Kauai and the Big Island may very well have the exact same number of visitors any given month, but the size of the island will also determine how "crowded" it feels. The largest in the chain typically ranges between 100,000-175,000 arrivals each month. Excluding the summer "hump" felt through all the islands, the number of arrivals fluctuates much less than some other islands in the chain, so visitation is usually about the same in Hawai'i. 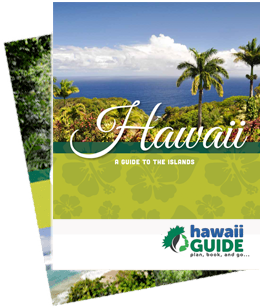 The events we noted on the best time to travel to Hawaii page, that are held each spring and fall, can increase visitor ratios on the island. The volcanic eruption that began in May 2018 is also to have likely affected arrival numbers for this period. The second largest island in the chain typically ranges between 210,000-300,000 arrivals each month. The summer "hump" is by far the largest period of arrivals, but there are also significant spikes at other times during the year, most notably around the Christmas holidays. The fourth largest island in the chain typically ranges between 100,000-140,000 visitors each month. Kauai, in general, is a much quieter island (arrival wise) when compared to the likes of the other islands in the chain. But that may be due to its size and "theme" (all things green). The summer "hump" is the only really busy time on the island, though it's not as distinct as the "hump" Maui and Oahu experience. The 2018 winter and spring storms and subsequent closures on Kauai likely affected visitor arrivals after this period. The third largest island in the chain typically ranges between 450,000-570,000 visitors each month. As you can quickly see, that number quickly dwarfs the other islands arrival data. Oahu is widely popular with visitors abroad, and given that 75% of the state's population lives on this single island, the arrival data can skew accordingly. If you want even more detailed tourism specifications, please visit the Hawaii Department of Business, Economic Development & Tourism. These two islands only make up slightly more than 1% of all visitor arrivals combined. If you're heading to either of these two islands and are curious about this data, we suggest you look at the detailed statistics provided on the Hawaii Tourism Authority website.